Easy Vegan Gluten-Free Pancakes that whip up quickly and are super fluffy. They’re the perfect breakfast to serve for a lazy weekend breakfast or brunch. 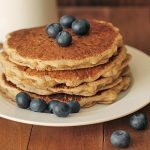 Back when I started experimenting with turning my favourite recipes into plant-based and/or gluten free versions, this recipe for easy vegan gluten free pancakes was one of the first I came up with. Come to think of it, it may have actually been the first! I held on to the shots because I thought, “hmm…this is *just* a pancake recipe. Does the internet really need another pancake recipe?” And the answer is YES. It does. Because these easy vegan gluten free pancakes are special. They’re special because they are everything you would expect a pancake to be, but maybe NOT what you would expect a vegan AND gluten free pancake to be. They are light, fluffy, and they’re delicious. When you find something that works, stick with it. Use it as a base and make small adjustments to suit whatever new thing you’re trying to come up with. What kind of flour should be used for this recipe? I have only tested this recipe with Bob’s Red Mill Gluten-Free All-Purpose Baking Flour. (the one with the red label you see in that link, NOT the one with the blue label!). You can find it in your grocery store (likely in the natural foods section), your health food store, or you can buy from Amazon. This flour is a blend of different flours and all gluten-free flour blends cannot always be interchanged easily because they all contain different ingredients and ratios. 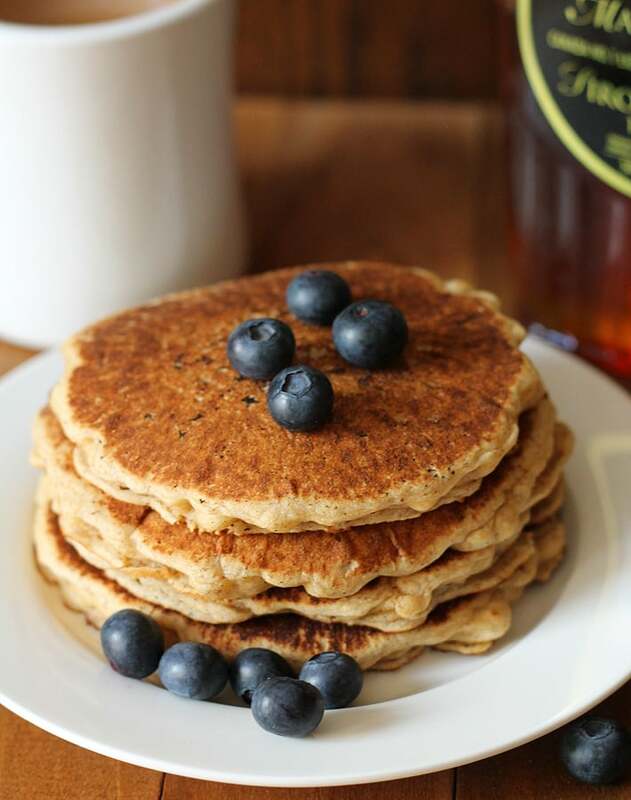 I have had readers who have used different flours with success, read through the comments below, but I can only speak about the flour I use for this recipe with confidence since I have been using it to make these pancakes for many years and have not had any fails. And…I know for sure that coconut flour will not work with this recipe. If you make them, post a pic on Instagram and tag me! I’d love to see your remake. I’m @delightfuladventures over there and my hashtag is #delightfuladventures. 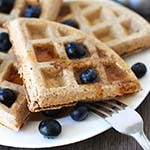 And be sure to check out my other delicious vegan breakfast recipe ideas! 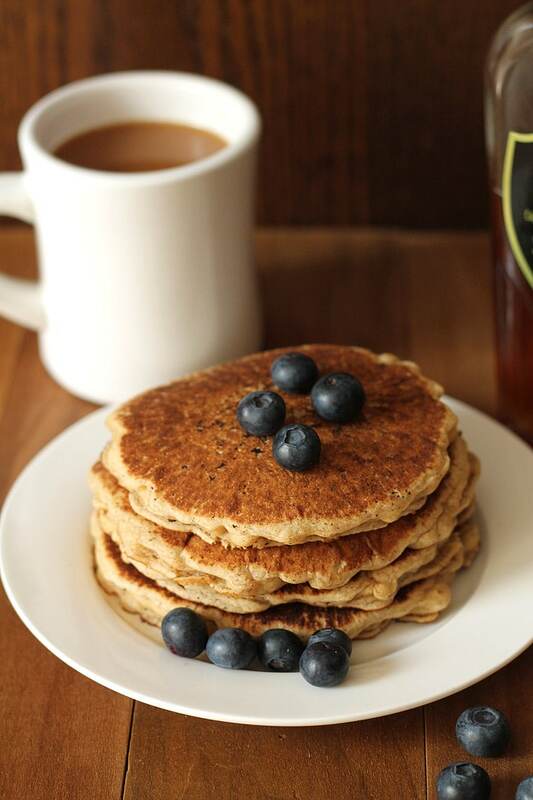 Your search for easy vegan gluten free pancakes has ended! These pancakes are delicious, fluffy and will become your new perfect go-to pancake recipe! Whisk milk, oil, vanilla, ground flax seeds, and maple syrup (if using) together in a medium-sized bowl, whisking enough to incorporate the flax seeds. Let sit for 5-minutes. Heat pan over medium-high heat for at least 2 minutes. Whisk flour, baking powder, baking soda, cinnamon and salt together in a large bowl. Slowly add wet ingredients to the dry ingredients, mixing well until incorporated. This recipe makes 8-10 pancakes, depending on how large or small you make them. Calorie count is for 1 of 8 pancakes without toppings and without the optional maple syrup added to the batter. When I make my pancakes, I use a thick, cast-iron pan. I usually turn mine after about a minute and a half, when the edges start to look dry. Some experimentation may be necessary until you get a feel for it. Everyone's griddle/pan will cook differently. It's important to know that all gluten-free flour blends use different ingredients and ratios, so results will always vary when you use different blends. I have never used any other brand of flour to make these pancakes (other than this one from Bob's Red Mill), so please know that your results may not be the same as mine if you substitute with a different flour. 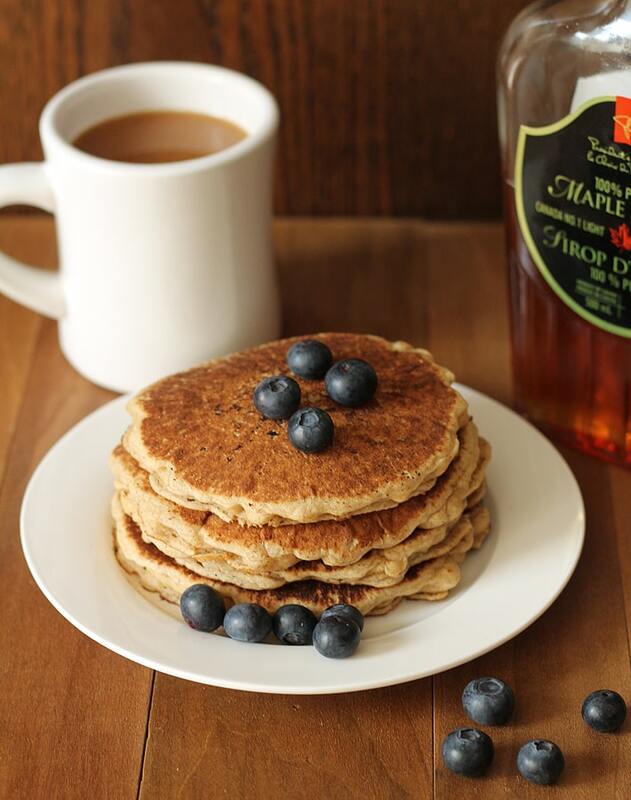 Nutrition info is based on 1 of 8 pancakes, without garnishes or maple syrup, and is only to be used as a rough guide. Click to learn how nutrition info is calculated on this website. These are the BEST gf vegan pancakes I’ve tried to date – by far! They were fluffier than any pancake I’ve ever eaten (including g those with gluten) I could easily break them with a fork. And so yummy!! Hello from a land very near Bob’s Red Mill. I always feel proud when someone is using this local label. This is my second time trying this recipe. So many other flour blends for gluten free, vegan pancakes have been an epic fail but this one has worked both times, beautifully. Thank you for taking the time to perfect and post this recipe and thank you for sharing that you use a cast iron skillet. I will be adding that to my wish list, this non-stick skillet is burning my pancakes. I mistakenly left my comment as a response above. Hi Leah! 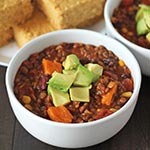 I LOVE Bob’s Red Mill products and use so many of them! That is so nice that they are local to you. I am glad that the recipe turned out well. And yes, I love using my cast iron skillet since it is naturally non-stick, it does take a little longer because I have to make them one by one, but I don’t mind 🙂 On days when I am in a rush, I do sometimes wish I had a griddle so I can make them all at once! Thanks so much for your note! 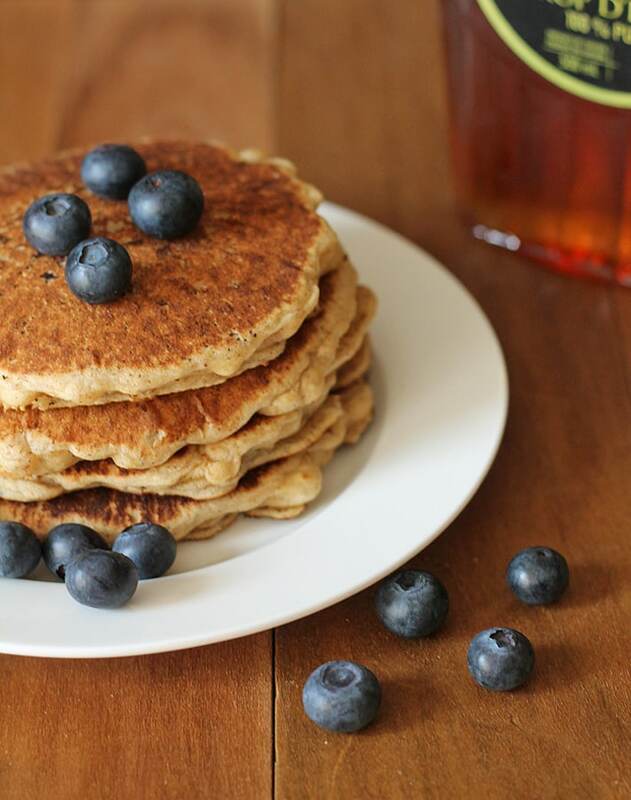 I have to say that this is the best gluten free vegan pancake recipe I’ve found…by FAR! Between two families, we have tried EVERYTHING and none of them turned out good, until I found this recipe. I’m so thankful and actually enjoy making pancakes again!! Thank you! Yay! I am so glad you decided to try yet another recipe after being disappointed so many times, Kristin. And I am so happy that you loved them. Thanks for your note! Added extra vanilla for the kids, otherwise they worked well and were a hit with my fussy toddler. Wonderful! It’s always great when the kids like a new recipe 🙂 Thanks for your note, Jen! Sorry to say, I did not get satisfactory results, even though I used the Bob’s Red Mill Red Label flour mix and exactly the ingredients and process you had in your recipe. I didn’t have flax seed or maple syrup, so they were left out. My pancakes were gummy. They did not turn a nice brown like yours but stayed pasty looking without a tan. The taste was good, but lacking the ‘fluffy’ characteristic. They puffed up nicely on the griddle, but in spite of cooking them thoroughly, they flattened out on the plate. Have you any other suggestions for troubleshooting? Since I am not vegan, would adding an egg help the end result? Hi Rita, I’m very sorry to hear they did not turn out well for you. If you used the Bob’s gf flour with the red label (this one), made no substitutions, and followed the directions exactly, then technically, they should have turned out. Omitting the maple syrup and flax should not cause gummy pancakes. The thing that comes to mind is your baking powder. Was it fresh? The baking powder is the ingredient that plays the role of “lifting” the pancakes up to make them fluffy and not gummy. Same for the baking soda. Make sure that both of those ingredients are fresh and not expired, or close to expiring, before trying again. Also be sure that everything is measured correctly. If you do try again, let me know how it goes. I hope this helps, Rita! This is my second time trying this recipe. So many other flour blends for gluten free, vegan pancakes have been an epic fail but this one has worked both times, beautifully. Thank you for taking the time to perfect and post this recipe and thank you for sharing that you use a cast iron skillet. I will be adding that to my wish list. Best gluten free pancake recipe EVER! I used Bob’s Red Mill, the one made from rice for not chickpea, and added some vinegar for a buttermilk flavor. So delish! I made these and split the batter in half and added chocolate chips to the other half. I also used vegan butter instead of oil. So good thank you! Even my non vegan non gf boyfriend loved them! These were simply perfect!! I halved the recipe to get 6 pancakes for my husband and I. 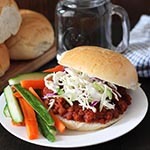 So fluffy, easy to make, and tasty! Thank you for a wonderful recipe! You are so very welcome, Lav! So happy that you like the pancakes 🙂 Thank you for your note, I appreciate it! I used Trader Joe’s gluten free all purpose and these were delicious! Thank you! Finally!!!! These are excellent. I used the Bob’s gf 1 to 1 baking flour, has blue on the label. And I was a bit short so used a couple Tbs of king Arthur gf blend. These are the best gf pancakes since we stopped eatitng eggs a couple years ago. That’s a lot of sub-par, gooey, weird pancakes we have tried over the years. Hi Jenn! I’m so glad to hear that the recipe worked well for you and that you’re happy with it. Also glad to hear that the gf flour with the blue label worked well. I heard from another reader not long ago who used it and didn’t end up with a good result. So I’m happy to hear that it worked out for you. Maybe it has to do with the other gf blend you combined it with? Not sure, but either way, yay! 🙂 Thanks so much for your message! Making my second batch now, as I was out of the flour blends and tried some buckwheat pancakes (yuck). I used only the blue label Bob’s and so far so good. Next time I want to weigh the flour as I feel I used too much and had to add water a little at a time to get a good consistency. I used a cast iron, grapeseed oil, almond breeze original, and no maple syrup. This batch is ever so slightly gummy, so maybe the 2tbs of king aurthur gf did balance it out, or that one I just tried wasn’t cooked long enough/too thick. BEST PANCAKES EVERRRR!!!!! You nailed it! Definitely have to stick to the Bob’s Red Mill Flour but that’s an easy compromise for pancakes that don’t stick to the pan and are the perfect consistency. Thank you for making Sunday morning brunch delicious again! Sadly no one in my family liked these. I followed the recipe exactly and used the same flour. The batter was so thick, I had to add more soy milk to get it to the right consistency. But the actual pancake came out gummy, not fluffy :(. I can’t figure out what went wrong.